Have you tried Golden Milk? I have and love how it knocks me out for 8+ hours. Give it a try! Share it with your family too. Yummy before bedtime and so comforting. "I don’t know about you… but when I think of tea, I prefer herbal teas like Chamomile or true teas like green tea. 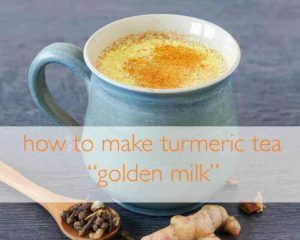 I certainly don’t immediately think of turmeric, but this earthy golden spice is the base of an age-old remedy called Golden Milk or Turmeric Tea. It takes a little getting used to, but this unusual tea is a staple in our house in the winter. I love to use it in cooking and as an herbal remedy. Especially this time of year, turmeric is a staple at our home for avoiding illness and keeping our immune systems strong. This bright yellow spice contains Curcumin (up to 3% by weight), which has been well studied for its benefits. It is believed to halt an enzyme that may be responsible for turning environmental toxins into carcinogens in the body. Turmeric is a folk remedy for helping protect the body from the affects of smoking or chewing tobacco. Curcumin may also improve digestion of fats and sugars and help alleviate inflammation in the digestive system. It is an age-old skin remedy and is even used in the mouth to help alleviate gum problems. Of course, Turmeric can be added to foods and is a great base for many spice blends, but those who want to consume it as a remedy often turn to turmeric tea. 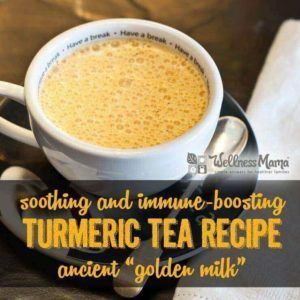 Turmeric Tea or Golden Milk is a great way to get the benefits of Turmeric daily. I love drinking this before bed because it aids relaxation and helps boost the immune system while sleeping. Then, Pour into a small sauce pan and heat for 3-5 minutes over medium heat until hot but not boiling. This may stain blenders and counter tops. The color isn't harmful and will eventually fade. Recipe can be halved or doubled if needed. Can I make this with almond/pecan/dairy milk? Absolutely! I mix it up and make it with any mixture of these. It won’t be as creamy, but you can even make this recipe with plain water instead of any milk at all. Bone broth is another great option for the base and you can omit the sweetener if you use broth. If you don’t use milk or broth, consider adding a tiny amount of some kind of fat (like butter or coconut oil) as it increases absorption. Feeling really brave? Try using Camel milk instead! Several readers also mentioned adding to their morning coffee…. Where do You Get Turmeric? 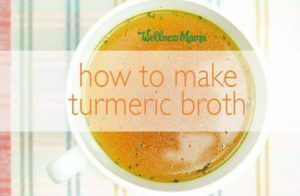 I always order turmeric in bulk because I use it in many spice blends, in beauty recipes and to make this tea. Look for one that is organic, non-irradiated, and that contains curcumin. I personally have ordered this one on on several occasions. What if I Don’t like Turmeric/Pepper/tea? Can I Omit the Honey/Maple Syrup? Of course. I find that it helps mellow out the strong flavor of the turmeric, but it is not necessary. You can also use blood sugar friendly stevia or nutrient rich blackstrap molasses to get the benefits. Is there another way to get the benefits? Sure! But this is the most tasty, in my opinion. If you aren’t into tea or don’t want to take the time to drink it, just add the ingredients to any food or take alone. For instance, throw some turmeric and black pepper and olive oil on some roasted veggies to accomplish the same thing. One brave reader mentioned that she just makes a paste of turmeric and avocado oil and swallows it with 2 whole peppercorns. 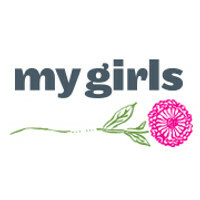 I Have ____ Health Condition or am Pregnant/Nursing. Can I Drink This? I always recommend talking with a doctor before consuming any natural remedy. Some sources say that this is fine since it only contains culinary amounts, but there are contraindications for those with certain conditions or on certain medications. There are sources that say it should be avoided by those with autoimmune issues and others that say it helped autoimmune issues. Talk to someone who knows your situation before making a decision. I give small amounts to my kids. Turmeric is a spice after all! They love the taste and love to help make it, but check with your pediatrician if you have any questions or concerns before drinking this. This Stained my Counter/Blender/Cup. What do I do? I have good news and bad news. The good news is that the stains aren’t harmful and will fade over time. The bad news is that it will take some time. Can I Make a Big Batch and Keep in the Fridge? Sure! I’ve made up to half a gallon and kept in the fridge. I find I enjoy it cold too, but it can also be reheated in a small saucepan. Can I Use Fresh Turmeric Root? Yes! It isn’t often available where we live so I stick with dry, but you can grate a 1-inch piece of fresh turmeric root into the recipe to accomplish the same thing. You may also want to strain it using a fine mesh strainer to remove any remaining pulp or pieces.